This is an original antique hand carved and painted wooden duck decoy that resembles a canvasback, complete with the original lead weight. There is a crack around the neck where the head connects to the body and it is slightly loose if significant pressure is applied (still pretty securely attached). Very nice old piece. 15 1/2"l x 5 1/4"w x 6 1/4"h. various scratches. see photos. Painted Plaster Duck Decoy Model. Marked 1965 Ethan Allen Collection. Has felt mounted on bottom. Glass eye on one side. I have not pulled the felt bottom back, but I think the duck body is made of plaster material. The duck is covered in authentic tobacco leaves and coated with clear polyurethane. A skilled person can probably patch or repair the distressed areas if desired. Vintage Plaster Duck Decoy . Shipped with USPS Priority Mail. I am not sure if this would be considered a decoy or decorative item. I would place this closer to an actual decoy vs a decorative item due to its crude paint and kind of unfinished bottom. This duck is not wood. Half scale model Canvas Back male duck decoy. No labels. Good Condition ! No Breaks No Cracks ! USA Plastic. Model is a Victor D-9 Duck Decoy. E.F PBOX7 13x13x8.5 4# 4oz. The two duck decoys are being sold together. They show normal wear for age. This wonderful UNIQUE DECOY is a RARE FIND. 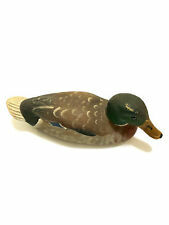 Antique Duck Decoy Vintage Duck Hollow . Shipped with USPS Priority Mail. I'm not sure of the brand. Unknown. Marks in pics.